The Soil Selfies as a physical project had its first viewing in Berlin at Global Soil Week 2015. The on-line resource for anyone anywhere in the world to use and contribute to has been gradually put on this website. With your help, I hope this continues to grow and be used. Soil Selfies show personal experiences of soil, that reflect the 2015 International Year of Soil’s theme Healthy soils for a healthy life. and what soil issues there are and/or how they are managed. Day 3 – the eastern Australian States (photos). The Soil Selfies collecton is a volunteer project by all contributors to create a collaborative educational resource about soils. Thankyou to everyone who has contributed to it. New visitors to this resource are invited to add your Soil Selfies to it, as well as explore it! 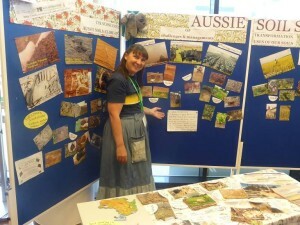 The Soil Selfies photo collection resource has been used many times now in the Wimmera for activities during the Soil Education Project at eight primary schools, and in various other displays, and at Fed Square for World Soil Day weekend 2015. My aim is that they continue to grow and be used.